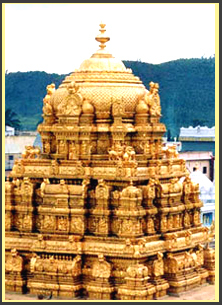 There is ample literary and epigraphic testimony to the antiquity of the temple of Lord Sri Venkateswara. All the great dynasties of rulers of the southern peninsula have paid homage to Lord Sri Venkateswara in this ancient shrine. The Pallavas of Kancheepuram (9th century AD), the Cholas of Thanjavur (a century later), the Pandyas of Madurai, and the kings and chieftains of Vijayanagar (14th - 15th century AD) were devotees of the Lord and they competed with one another in endowing the temple with rich offerings and contributions. After the decline of the Vijayanagar dynasty, nobles and chieftains from all parts of the country continued to pay their homage and offer gifts to the temple. The Maratha general, Raghoji Bhonsle, visited the temple and set up a permanent endowment for the conduct of worship in the temple. He also presented valuable jewels to the Lord, including a large emerald which is still preserved in a box named after the General. Among the later rulers who have endowed large amounts are the rulers of Mysore and Gadwal. After the fall of the Hindu kingdoms, the Muslim rulers of Karnataka and then the Britishers took over, and many of the temples came under their supervisory and protective control. In 1843 AD, the East India Company divested itself of the direct management of non-Christian places of worship and native religious institutions. The administration of the shrine of Sri Venkateswara and a number of estates were then entrusted to Sri Seva Dossji of the Hatiramji Mutt at Tirumala, and the temple remained under the administration of the Mahants for nearly a century, till 1933 AD. In 1933, the Madras Legislature passed a special act, which empowered the Tirumala Tirupati Devasthanams(TTD) Committee to control and administer a fixed group of temples in the Tirumala-Tirupati area, through a Commissioner appointed by the Government of Madras. In 1951, the Act of 1933 was replaced by an enactment whereby the administration of TTD was entrusted to a Board of Trustees, and an Executive Officer was appointed by the Government . The provisions of the Act of 1951 were retained by Charitable and Religious Endowments Act, 1966. The Moolavar is Govindaraja Perumal seen in bujanga sayanam facing east. There is a sannadhi for Aandaal. Moolavar - Thiruvengadamudaiaan, Srinivaasan, Venkataachalapathy, Baalaaji seen in standing posture facing east. The utsavar is Kalyaana Venkateswarar. The temple is located on seven hills - Venkataadri, Seshaasalam, Vedaasalam, Garudaasalam, Vrushabaadri, Anjanaadri, Anaandaadri. The sannadhi of Aadi Varaahar is at the north west of Swami Pushkarini. 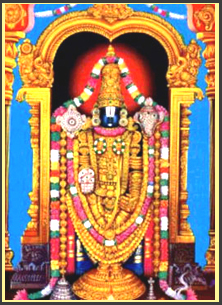 Devotees must worship this lord before the darshan of Lord Venkateswara. 14 Theerthams - Vaigunda Theertham, Chakra Theertham, Jaabaali Theertham, Varuna Theertham, Aagaasa Gangai, Paapavinaasam, Paandava Theertham, Kumaarathaarai, Ramakrishna Theertham, Thumburu Theertham, Sesha Theertham, Sugasanthana Theertham, Yuddhakala Theertham, Seethamma Theertham. Moolavar - Thaayaar - Alarmelmangai (Padmaavathi) facing east. The foothills are better known as Keezh Thirupathi, where one can worship Lord Govindarajan. The Kshetra witnesses heavy crowds round-the-clock all days of the year. One has to spend a minimum of half-a-day in the queue for the darshan of the Lord. The temple for the Lordess is located near Keezh Thirupathy, in a town called Thiruchchanoor. Thirupathi is best serviced by Roadways and Railways. And now even by airways(I don't know the exact service details). Alight at Renigunta Railway Station on the Arakkonam(Chennai) - Mumbai line and one can go atop the hill by buses along the ghat road. The Moolavar of this Salagrama sthalam is Sri Moorthy Perumal. He is found in Nindra thirukkolam facing his thirumugham along North direction. 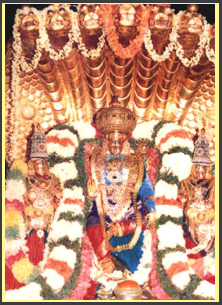 Prathyaksham for Brahma devan, Rudran and Kandaki. Muktinath is a pilgrimage shrine located 140 kms from Kathmandu in the snow clad Himalayas and it is located near the Kandaki river famous for the Salagrama stones. Muktinath is also one of the 51 Sakthi Peetams of India. There is lots of doubt, where this Divyadesam is located. Some says that Mukthinath, which is found 170 kms from Katmandu, it is said the Salagrama Kshetram which is found on the banks of Kandaki river. Mukthinath is otherwise called as "Mukthi Narayanan kshetram". But, some say, about 65 kms away from Katmandu, there is a place by named "Damodhara Kund", which is found on the bank of Kandaki river is said to be the Salagrama sthalam. But, whatever it might be, we all the bhaktas should consider that the stones (the Salagramam) which is found on the bank of Kandaki river is said to be considered as the Salagrama sthalam.